The Place If you are familiar with the new developments in Tanjong Pagar, Accor’s Sofitel Singapore City Centre is one of the most highly anticipated hotel opening this year. Racines restaurant located within this brand new spanking hotel is set to open come 2 October, helmed by Executive Chef Jean-Charles Dubois. Racines literally means “roots” in French, which is the fundamental concept of the all-day restaurant – to stay true to the authenticity of both French and Chinese cuisines. Located at level five of Sofitel Singapore City Centre, my first impression of Racines is the spacious setting coupled with full glass panes around the restaurant. There is a nice dose of natural lighting in the day, with splendid views of the Tanjong Pagar district including the iconic Pinnacle at Duxton. The interior design is contemporary chic, with plenty of cosy and comfy sofa seats. The open kitchen concept also adds to the interactive dining experience. If you are coming by MRT, there are direct lifts from Tanjong Pagar MRT and the restaurant is situated at the hotel’s main lobby area. The Food I was mistaken that Racines is a French-Chinese fusion concept but this is not the case. You get the best of both the French and Chinese cuisines, with Executive Chef Jean-Charles Dubois overseeing the culinary team. Other than an à la carte menu, Racines also provides guests and diners with buffet breakfast, 3-Course Set lunches at S$38++ inclusive of Nespresso coffee or TWG Tea on weekdays, and dinner daily. There are also plans for themed champagne brunches on weekends. We started with the Lobster Bisque (S$28) soup, one of the most traditional French dishes. I was surprised to find basil and Emmental ravioli in the soup, which was very appetising and rich in flavour. One of my favourite dish of the night, the Chargrilled Galician Octopus (S$26) with Avocado, Lime Creme Fraiche and Smoked Sweet Paprika is nothing short of amazing. 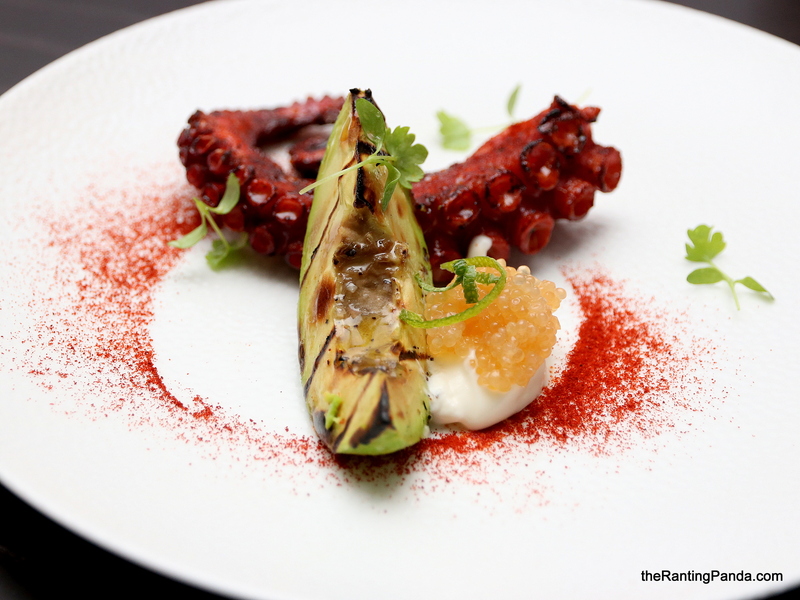 This Southern France dish has Mediterranean influences, and I especially enjoyed the citrusy notes of the lime cream sauce along with the chewy and well grilled octopus. For something healthier to start, the Local Kale Salad (S$22) with Black Olive Cookie, Baby Heirloom Tomatoes, Toasted Pumpkin Seeds and Passion Fruit Vinaigrette is pretty ideal. I understood from Chef that the hotel and restaurant advocates local produce and environmental sustainability quite strongly, hence the use of local produce where possible. My favourite element of the salad is ironically the crunchy black olive cookie, which balanced the refreshing notes of the salad. For mains, I was impressed with the Wagyu Beef Cheek (S$38), slow cooked for 48 hours and served with truffle mashed potatoes and seasonal greens. This traditional French dish is one of Chef’s signatures, and it is easily one of the best version I have had, at least in Singapore. The Wagyu beef cheek flavour was just right, not too rich yet it brought out the essence of the dish. The sides like the truffle mashed potatoes was stellar as well. Crossing over to the Chinese dishes, we tried the Nyonya Style Stir-Fried Calamari (S$68, serves 2) and the Sweet and Sour Crispy Kurobuta Pork (S$38). I really enjoyed the calamari, which was stir-fried with spicy sauce and goes so well with white rice. The calamari had a nice and chewy texture. The Sweet and Sour Crispy Kurobuta Pork fared well too, prepared from Japanese black pork. The pork had a good fat-to-meat ratio, where the crispy texture made it even more delectable. One of the highlights at Racines is the Frog Legs done both the French and Chinese styles. The Pan Fried Local Boneless Frog Legs (S$26) with Pink Garlic, Parsley and Wild Mushroom Emulsion is a dish I rarely tried in French cuisine, ignorant to the fact that it is quite a popular dish in France as Chef mentioned. The frog meat here had a chewy texture, with its taste resembling that of chicken. The Chinese version of Frog (S$58, serves 2) leg here is done the Szechuan way, a stark juxtaposition to the French way in terms of flavour and presentation. The texture of the frog meat is not much different between both styles, though I thought that the spicy notes here could be even more pronounced. My preference – go French here. For desserts, expect a cross between French and Asian flavours, though they are all equally impressive on its own. The Mango Sticky Rice (S$14) with Sliced Mango, Sticky Rice and Homemade Coconut Ice Cream is one of the heavier dessert but it was well balanced by the coconut ice cream. For something lighter, the Yuzu Tart (S$16) with Crumble is a safe bet. The tart has a firm texture while the yuzu element was just right for me. My favourite for dessert is undoubtedly the Mousse Au Chocolat (S$16) with Valrhona Mousse, Chantilly and Crispy Pearls. This is a chocolate lover’s paradise. It wasn’t too sweet, yet rich and slightly bitter. The crispy pearls are delicious. Rants The prices are relatively steep for the à la carte menu, with an estimated budget of at least S$60 per pax conservatively. Comparatively, there is a 3-course Chef’s French Dégustation (S$78) and Chef’s Chinese Inspiration (S$78) options which I feel is more value for money. Will I Return Again? The concept of Racines, offering both distinct French and Chinese dishes is a smart positioning, which will cater to a wider dining audience including our folks. The dishes I tried are quite consistent, with distinct flavours and stay true to the idea of restaurant – keeping to the roots of the cuisine. I can’t wait for it to be officially opened. Racines will officially open on 2 October. Make your reservation instantly at Racines here.